Does Coke taste even better if you tilt the bottle up that high as you’re drinking it? 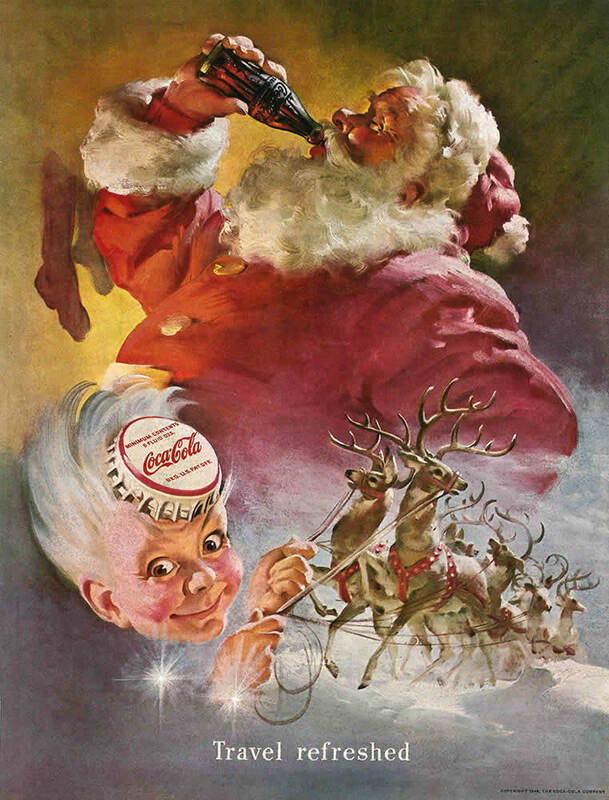 Did Santa pound that bottle cap into the Coca-Cola’s Sprite Boy’s forehead? Does it mind control, lobotomize or zombify poor Sprite Boy? Was Sprite Boy a naughty boy and this is his punishment? If sprites are tiny, just how tiny are those tiny reindeer? Seriously, that bottle cap looks like it hurts. Just look at his eyes. Trivia: Coca-Cola didn’t introduce Sprite until 1961, which makes Sprite Boy pre-Sprite. I’m sure it all made sense at the time. This entry was posted in ads of yore and tagged ad, ads, advertisement, advertisements, advertising, branding, coca-cola, coke, marketing, santa, santa claus, sprite boy, vintage ads on December 22, 2017 by Clayton Hove.